namely the gods in her place. Mistress of the Pyramid, and on the north of Osiris, Lord of Rostaw. gilded stone, and which had a length of about 7 ells [3.7 metres]. eternity, having always its face regarding the Orient. " He made for his mother Isis, the Divine Mother, Mistress of the Western Mountain, a decree made on a stela, he gave to her a divine offering, and he built her a temple of stone, renewing what he had found, namely the gods in her place. He found the house of Isis, Mistress of the Pyramid, beside the house of the Sphinx of [Harmakhis] on the northwest of the house of Osiris, Lord of Rosta (Rʾ-stʾ). 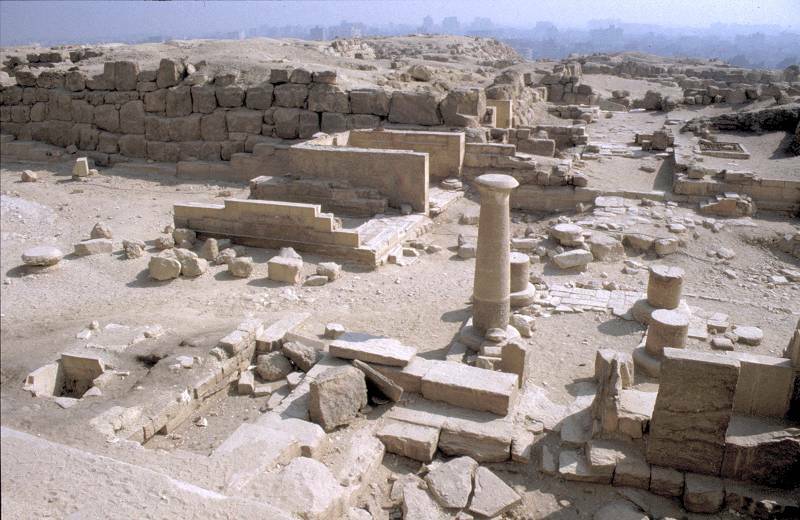 He built his pyramid beside the temple of this goddess, and he built a pyramid for the king’s-daughter Henutsen (Ḥnwt-sn) beside this temple. This is quite a bit different to me as one is suggesting it's next to the Sphinx enclosure but the other says it is beside the "House of the Sphinx" which implies the Sphinx temple. 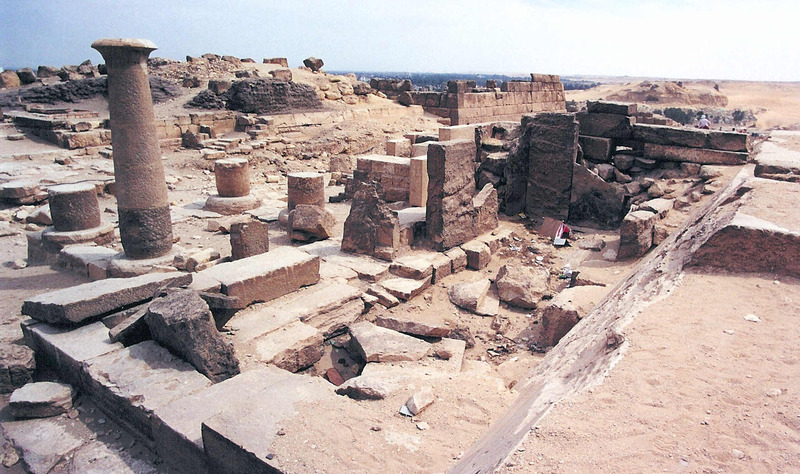 Regardless, according to the stela,before Khufu built any pyramids, he found the House of Isis beside the House of the Sphinx northwest of the House of Osiris. It is interesting to note at this point that the writer of the Inventory Stela does not associate the Sphinx and/or Valley Temple with Khafre in any way let alone even mention him or Menkaure or their pyramids. Some thoughts I have is that first order of business is for Khufu to rebuild an already existing temple and dedicate it to Isis. The dedication to Isis is no doubt a later invention, but regardless of who it was rebuilt for we are left with the idea that a temple already existed before he built his pyramid, real or imagined, which was apparently so important he choose to build his own pyramid right next to it as well as his daughter's. If the previous temple were anything like the later one it is hardly worthy of such reverence leaving one to question what in fact they are reffering to. Henutsen was most possibly interred in pyramid G1-c. Egyptologists believe that this pyramid was originally not part of Khufu's pyramid complex, but later added, as its southern side is not aligned with that of the Great Pyramid. 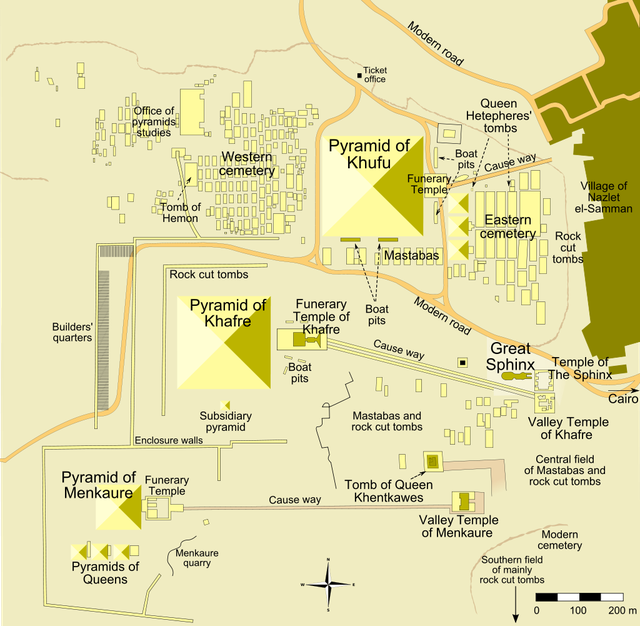 In fact, the pyramid's southern side is aligned with Khufukhaf's mastaba tomb nearby. Rainer Stadelmann additionally believes that prince Khufukhaf was identical to king Khafra and that Khafra erected G1-c as the tomb for his (now royal) mother. Pyramid G1-c was long time thought to be a satellite pyramid, because it did not come with a boat pit, as it was the case for the pyramids G1-a and G1-b. G1-c was later identified as an unfinished pyramid which was constructed in a hurry. Not exactly a glowing endorsement for the idea Khufu built his and his daughters pyramid in conjunction with one another not to mention the only reason G1c is attributed to Henutsen is because of the Inventory stela itself which the pyramid is otherwise anonymous. Hmm. Regardless, the Inventory stela does in fact report Khufu built his pyramid relatively "next" to the temple, also said to have originally existed before he built his pyramid, which unless it was one of the other satellite pyramids there is little other conclusion than it refers to G1. The place of Hwran-Hor-em-akhet is on the south of the House of Isis, Mistress of the Pyramid, and on the north of Osiris, Lord of Rostaw. The plans of the Image of Hor-em-akhet were brought in order to bring to revision the sayings of the disposition of the Image of the Very Redoubtable. He restored the statue all covered in painting, of the Guardian of the Atmosphere, who guides the winds with his gaze. He made to quarry the hind part of the nemes headdress, which was lacking, from gilded stone, and which had a length of about 7 ells [3.7 metres]. While it is quite clear the stela is saying Khufu restored the Sphinx, meaning it was already there before his time, what he supposedly did to it is curious. "The plans of the Image of Hor-em-akhet [the Sphinx] were brought...." The people who wrote the stela did not think the "image", i.e. the face, of the Sphinx was Khafre or any other pharaoh for that matter nor did Khufu bring an image of himself. The image was that of Hor-em-akhet-the Sphinx. To continue, they brought this image "in order to bring to revision the sayings of the disposition of the Image of the Very Redoubtable". Hmm. I am not sure exactly what this refers to, but as I read it the image was required to revise what was there in accordance with the "sayings of the disposition of the Image of the Very Redoubtable", i.e. to change the existing face. Need to wrap this up, but while the Inventory stela does say Khufu built his pyramid at Giza it also says that the Sphinx and associated temples, and at least one other, were already there before Khufu. Edited 1 time(s). Last edit at 13-Jun-18 04:06 by Thanos5150.